Kolkata, Aug 21 : Thousands of northeastern people got off cramped up trains coming from Bengaluru, Chennai and Pune at Howrah station on Monday and started preparing for the next journey back home. More than the weariness of the journey, fear and uncertainty were evident on their faces. While some squatted on the railway platform, some thronged the ticket counters to enquire about the availability of tickets. The station resembled a mini northeast. Meren, a BPO employee in Bengaluru, had spent two days near the toilet of an overcrowded train. On Monday, he was busy settling a deal with a tout right in front of the Howrah GRP to get a reservation on Kamrup Express. He paid Rs 2700 for three tickets and finally managed to get a seat. His friend Mark, an IT student originally from Nagaland, was trying to find out if Kolkata was a safe city. The 20-year-old said, "This was the worst experience of my life. I am considering the option of studying in Kolkata. I do not want to be driven out of a city again." 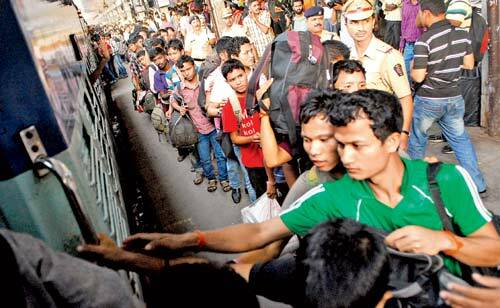 Besides those hailing from northeast, people from Bengal were also forced to leave. Sudip Rai, from Kalchini in Jalpaiguri, worked as a security guard in Pune. He said, "In Pune, over 300 people from New Alipurduar work in different hotels. We decided to return home as tension was mounting up in Pune. We prefer to die in our village." "But there is no work at home. So we need to go out to work. Nahole khabo ki? (else what will we eat? )," asked Sudip. His colleague Sanjay said, "We could not bring money with us. We just left our rooms as panic gripped Pune." Though neither Sudip nor Sanjay saw anybody being beaten up, but rumours sparked the panic. Zank Panmei, a first-year student from Thangal Bazaar in Imphal, however, saw one of the youths from the northeast being beaten up. "I am too scared to stay in Pune now. I hope things will improve within a week. I wish to return by early September." Some students from Bengaluru also narrated their personal experience of being attacked. A student of Al Ameen College who did not want to be named said stones were hurled at him and his friends. "It is difficult to continue staying there with such fear," the youth added. Binay Milli of Golaghat, Assam has been working in Chennai for the past four years. This is the first time he has faced such a situation. "Several rumours have unnerved us. So, I decided to go home till things are normal. At least 400 men travelled with me to Howrah fearing trouble in Chennai." The moment special trains for Guwahati were announced, there was a rush to grab a seat. Mary, a 20-year-old from Senapati district of Manipur, who returned from Bengaluru said she had to sit on the floor of train to reach Howrah. Though scared, Mary said she might have to return to Bengaluru since she works in the retail sector. They are heading for home for safety, where uncertainty looms large. It was a mini North East in Howrah station on Monday. More than weariness of the train journey, paleness in their faces were prominent due to the fear psychosis and rumour that drove them out from Bengaluru, Chennai, Hyderabad and Pune admixed with an indecisive future. However, they are optimistic to return back to study or work. With trains coming from Bengaluru, Chennai, Pune, thousands of NE people were at Howrah station waiting to reach home quickly. Meren a BPO worker in Bengaluru was busy settling a deal with a tout right in front of the Howrah GRP on Monday noon to get a reservation to Dimapur on Karmrup Express. He paid Rs 2700 for three tickets. He finally managed to get a seat. For the last two days he came in a cramped compartment on a Bengaluru special train. He had to sit on the floor near the stinking toilet. But reaching the toilet was tough as it was overcrowded. His friend Mark an IT student, also from Nagaland was busy finding out if Kolkata was a safe city. Mark said this was the worst experience in his 20-year life. "I am considering if I can study in Kolkata. I do not want to be driven out of a city." Not only people from NE were forced to leave, people from Bengal were also forced out. Sudip Rai of Kalchini, Jalpaiguri said, "In Pune over 300 people from New Alipurduar work in different hotels. We decided to return home as tension was high in Pune. We prefer to die in our village." "But we need to go out to work. There is no work at home." Rai asked, "Khabo ki?" His colleague Sanjay Rai, a security guard said, "We failed to bring money. We left shutting our rooms, as panic gripped Pune." Both of them however did not know any one who was attacked in Pune, but said rumours were spread through mobile. They felt lucky as food was delivered free to Howrah bound passengers at three different stations. Even, Kesav Rai of Siliguri had a trying time to return who had gone to meet her sister at Bengaluru. First year student Zank Panmei who hails from Thangal Bazaar in Imphal is one who saw a youth from NE being attacked. "I am too afraid to stay in Pune now. Hope things will improve within a week. I hope to return by early September." As special trains for Guwahati were announced there were huge rush to get a seat. Mary, a 20-year girl from Senapati district of Manipur who returned from Bengaluru with four others said that they had to sit all the way from Benagaluru on the floor. "We did not have forty winks on Saturday or Sunday night." She was scared while travelling in the train, as there are several rumours, though police were in the train. "I think we all have to return to Bengaluru, as we work in retail. Though working people are targeted." Several students from Bengaluru narrated how they were attacked or threatened. A student of Al Ameen College who do not want to be named said how stones were hurled at them. There were regular threats after the Assam violence. "It is difficult to continue with such panic." Binay Milli of Golaghat, Assam is working in Chennai for four years. "There are several rumours for which we are unnerved as it is a huge mental pressure. So, I decided to go home till normalcy resumes. At least 400 men travelled with me to Howrah fearing trouble in Chennai."